WASHINGTON - U.S. President Donald Trump notified Congress on Friday that he plans to sign an agreement with Mexico in 90 days to replace the North American Free Trade Agreement, and hopes Canada can be brought on board. Under U.S. trade rules, the American team doesn’t have to make public the text of the revamped agreement for 30 additional days, buying more time to reach a deal with the Canadians. Talks to keep Canada in the trade bloc adjourned Friday, divided over such issues as Canada’s dairy market and U.S. efforts to shield drug companies from generic competition. The U.S. and Mexico reached a deal on Monday that excluded Canada. 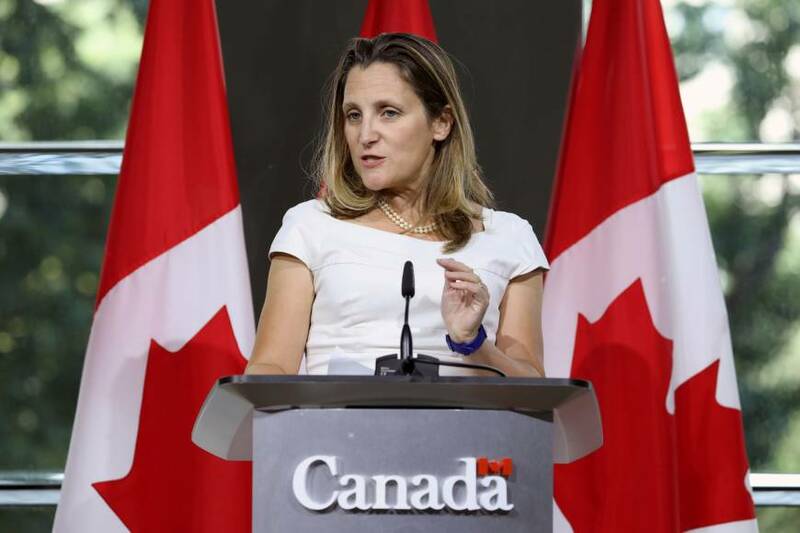 Canadian Foreign Affairs Minister Chrystia Freeland hurried to Washington for talks aimed at preserving Canada’s membership in the regional agreement. 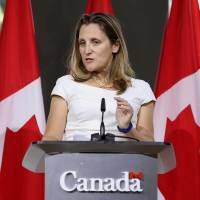 But Freeland couldn’t break an impasse in four days of negotiations with U.S. Trade Representative Robert Lighthizer. The talks will resume Wednesday. Freeland expressed confidence that Canada could reach a deal with the United States on a revamped trade accord that could please all sides. “We know a win-win-win agreement is within reach,” she said. “The approach the Trump administration has taken — ‘my way or the highway’ — doesn’t seem designed to get to yes,” said Michael Camunez, CEO of Monarch Global Strategies, who served in former U.S. President Barack Obama’s Commerce Department. The 24-year-old NAFTA tore down most trade barriers dividing the United States, Mexico and Canada. Trade between the three countries surged. But many manufacturers responded to the agreement by moving factories south of the U.S. border to take advantage of low Mexican wages, then shipping goods north to the United States and Canada. Trump has charged that the deal wiped out American factory jobs. He has vowed to negotiate a better deal — or withdraw from NAFTA altogether. But Daniel Ujczo, a trade attorney of the law firm Dickinson Wright in Columbus, Ohio, and others say the flash points include trade barriers that protect Canadian dairy farmers and Ottawa’s insistence on keeping NAFTA provisions for resolving disputes. Also nettlesome is a provision in the U.S.-Mexico deal that shields U.S. makers of biologics — ultra-expensive drugs produced in living cells — from generic competition for 10 years instead of the eight Canada is willing to live with. Canada fears the protection will drive up drug prices and make their government health care system more costly. When the Trump administration notified Congress last year that it intended to renegotiate NAFTA, it said it would enter talks with both Canada and Mexico. It is unclear whether the Trump team even has the authority to reach a pact with just one of those countries. And Congress, which has to approve any NAFTA rewrite, might refuse to endorse a deal that excludes Canada. The administration has also applied taxes to $50 billion in Chinese products, mostly goods used in manufacturing. And it is considering slapping tariffs of up to 25 percent on an additional $200 billion in Chinese imports after a public comment period ends Thursday. Unlike the previous Chinese imports subject to U.S. tariffs, this larger group of goods includes parts and materials that U.S. companies depend on, along with consumer goods. These tariffs are the administration’s response to its charges that Beijing uses predatory tactics to try to supplant U.S. technological supremacy. Beijing’s tactics include cybertheft and a requirement that American companies hand over trade secrets in exchange for access to China’s market.